INDUSTRY.co.id - Jakarta - Synthesis Development held halalbihalal with the media crew while delivering the progress of its projects. Starting from the Residence Synthesis Kemang, Prajawangsa City, Samara Suites to Pontianak Green Synthesis. Focus Synthesis Residence Kemang is currently the construction of Nakula and Sadewa Tower. Excavation 4 basement is finished, with a depth of approximately 20 meters, and the foundry process is underway. "The development process is continuing so that our target handover at the end of 2020 can be timely," said Imron Rosyadi, Property Investment Advisor Synthesis Development for Synthesis Residence Kemang, at Kila Kila by Akasya, Jakarta, where the event took place (Wednesday, 11/07 ). Meanwhile, from the sales side, Imron added, "Tower Sadewa is almost gone. The remaining 'stock' is approximately 3%. For Nakula there are still about 50%. " For Prajawangsa City, the superblock project in Cijantung continues to target millennials through lively promos as well as lifestyle solutions. If previously there is a fun program Paid To Rent Apartments, now present new program Fun Paid to Japan. So, for every buyer Prajawangsa City unit will depart trip to Japan, for free! "Millennial, right, hobby traveling," said Asnedi as Property Investment Advisor Synthesis Development for Prajawangsa City. "If the money is used to repay the dwelling, how his traveling hobby can still run? Well, Prajawangsa City gives the solution through this program. " 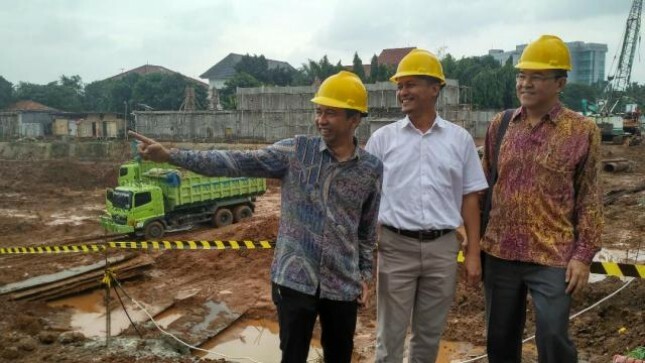 He also revealed that until now Prajawangsa City is still at the top in terms of sales compared to other residential projects in the area of ​​East Jakarta. Last turn Andi Setiyawan, Property Investment Advisor Synthesis Development for Synthesis Square delivered an update Samara Suites. Samara Suites, as described Andi, leaving only the best 43 units out of 292 units. "Developers always keep their best units for sale last, usually the low floors and the best view," explained Andi. "Currently 43 units have been released to the public, and the type 2 bedroom living 6 units." As the first business apartment in Indonesia, the location of Samara Suites on Jl. Jend. Gatot Subroto is very strategic, close to the business points in Jakarta. "So, potential buyers should not miss this 43 units. But if you want to jam-macetan 16 km / h, or to jam-jametan on the 30 km / h toll, monggo, "joked Andi with his unique style of chat. "Congestion is inevitable, we must meet the traffic jam. Which can be trimmed is the distance. " Andi also revealed that the office space in the area Synthesis Square, in Tower 2, on the 12th floor sold out. While the 5th floor is already in the book. Outside the apartment project, Synthesis Development is also developing a residential area. Green Synthesis Pontianak, the name of the housing in question, was built according to the needs of the people of Pontianak with all its uniqueness. "One of them, because Pontianak still often die electricity, then we provide generators for anticipation to overcome the problem," said Imron. Housing in downtown Pontianak will also be the first residential area of ​​the first complete, with facilities such as club house, swimming pool, fitness center, to the sports field. The Pontianak Green Synthesis project is currently at the cut and fill stage, and is planned to be launched in September 2018. "We want to start building the city of Pontianak, at least through better housing," Conclude Imron.